"I know of one photographer, who obtained on Clapham Common no less than thirty-six shillings in the course of one hour. This, however, was altogether an exceptional circumstance, and a receipt of ten shillings a day is considered very fair for the common. Out of this sum about a quarter should be deducted for general expenses; and the work is not always pleasant. The photographer dare not leave his apparatus, for it is impossible to guess when a subject may present himself. He must stand for hours on the damp earth, idling away his time, when perhaps just as his patience is giving way, a tradesman's cart will pull up, and his services are requisitioned to immortalize by his art the waggon which conveys groceries to the prosperous bourgeoisie of Clapham. 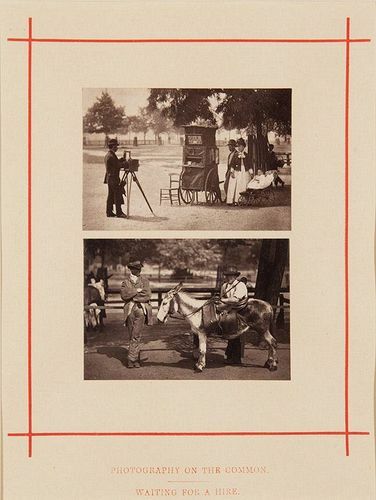 [...] "By the side of the photographer, stands the donkey-boy, who also derives special benefit from the close proximity of Clapham Common. He lives in a slum hard by, and belongs to that peculiar and distinct race known under the generic term of costermongers. [...] "The photograph, however, portrays Mr. Laurence's son, leaning affectionately over his dumb companion, and a labourer, temporarily out of work, who has volunteered to assist him in his charge, and is evidently enjoying the sport. [...] "Altogether it will be seen that the commons and open spaces in and about London, are not merely useful in maintaining the health of the population, and as affording some space for recreation; but they also open out new fields of industry for those who earn their living out of doors. On the great holidays, the itinerant street vendors crowd to the Common, and are able to breathe fresh air while still pursuing their ordinary avocations."